Though you hardly ever see him in public or photos, senior White House adviser Kellyanne Conway’s husband, George, is an accomplished attorney who works at the prestigious law firm Wachtell Lipton. In recent days, there’s been chatter in the Washington press that Ms. Conway is being considered to replace Hope Hicks as Communications Director for the Trump administration. 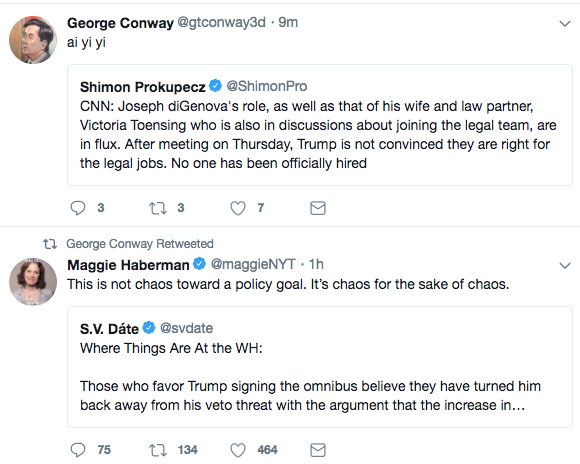 And apparently that, along with a tweet from reporter Kaitlan Collins on how thankless the job is led George Conway to fire off a tweet that is clearly a dig at Donald Trump. This is why officials are so hesitant to speak for Trump. He says one thing, then does the opposite. He says he’s happy with McMaster, they defend him, then he fires him a week later. He says he’ll sign the bill, they publicly say as much, then he tweets he's considering a veto. Ouch! Sounds like Mr. Conway isn’t the world’s biggest fan of Donnie Dollhands. And that shouldn’t surprise anyone when you consider that last year it leaked out Trump was considering George Conway to head the Justice Department’s Civil Division. Conway rejected that offer. Insightful, Mr. Conway. Or is this an alternative fact? How does Kelly-Anne feel? Do tell. Proving that even in the US there are traitors to our constitution. People more concerned with greed, power and $$$ then our Republic, Like you and your wife. Only the corrupt, complicit or those obsessed with power would work for this crooked regime. I thought this was a great tweet for the sarcasm but then I saw the last name of the devil herself. We’re pretty sure he doesn’t have a red MAGA hat at home. This entry was posted in Social Media, The Trump Adminstration and tagged Donald Douchenozzle, Twitter. Bookmark the permalink.